Chancellor's Blog: UIS Theatre program does it again! UIS Theatre program does it again! 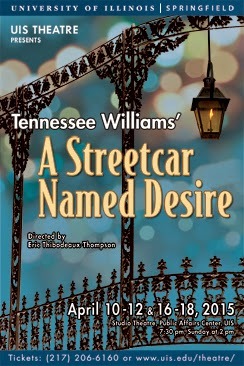 My husband and I had the pleasure of attending the UIS Theatre program’s production of Tennessee William's “A Streetcar Named Desire” last night and it was outstanding! As is always the case in the UIS Theatre program, the choice of plays – another Pulitzer Prize winning work - set the stage for both the actors and the audience to experience something very, very special. The set, musical background and technical aspects of the production were outstanding and I’m sure many students had a great experience working and learning under the direction of Professor Dathan Powell, the Technical Director and Set Designer. Eric Thibodeaux-Thompson, Associate Professor of Theatre was Director of the production and he created a really wonderful performance. We were drawn in and held from the first scene right through to the last moment. Missy Thibodeaux-Thompson, also Associate Professor of Theatre, was in the starring role and her portrayal of Blanche DuBois was just amazing. It was a privilege to be in the audience and watch her bring Blanche to life in such a deeply believable, compelling and sympathetic way. I found myself imagining the poor woman waiting on dying relatives one after another as the old plantation property shrinks and crumbles around her and later feeling so desperate for any semblance of her longed-for former respectable life. Each of our student actors – Stella, Eunice and others - also did a great job – a strong indication that we already have in place the foundations of talent needed for the new Theatre major that the department has proposed. Thank you UIS Theatre program for providing me and all the members of the audience with a truly exceptional evening of theatre. You all deserve a standing ovation! If you haven’t seen the UIS Theatre production of “A Streetcar Named Desire,” you can still catch a performance tonight or Saturday night in the Studio Theatre on the UIS campus.